Tupac Jr.'s debut. Cerebro beat Diablo. Canis Lupus replaced X-Fly. Tecnicos took 1/3. Veneno and Alan beat Canis and AK-47 for the win. 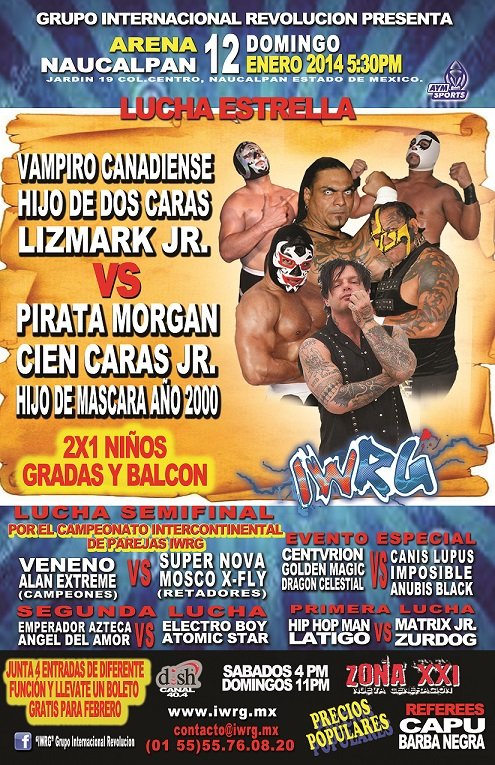 Turned out to be Lizmark Jr., not Sr. X-Fly replaced Pirata Morgan. Rudos actually ran out and attakced the tecnicos from the last match (X-Fly & Super Nova still feuding with Alan & Veneno) and the main event tecnicos made the save. 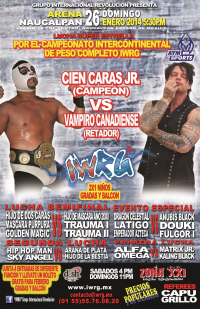 Tecnicos took the first, but the rudos took the last two, with Cien foul on Vampiro in the third. Alan Extreme replaced Latigo. Astro beat Imposible. 911 ripped up Magic's' mask and bloodied him. Magic still got the win. They had a 10 minute time minimum. Dragoncito de Oro was first out. Mini Multifacetico used a Canadian Destroyer on Mini Rock Spirit to escape last, leaving Rock Spirit to get his hair cut. Angel del Amor's first match here since June. Lupus wants another match with Golden Magic, but his teammates lost to Golden Magic's teammates. 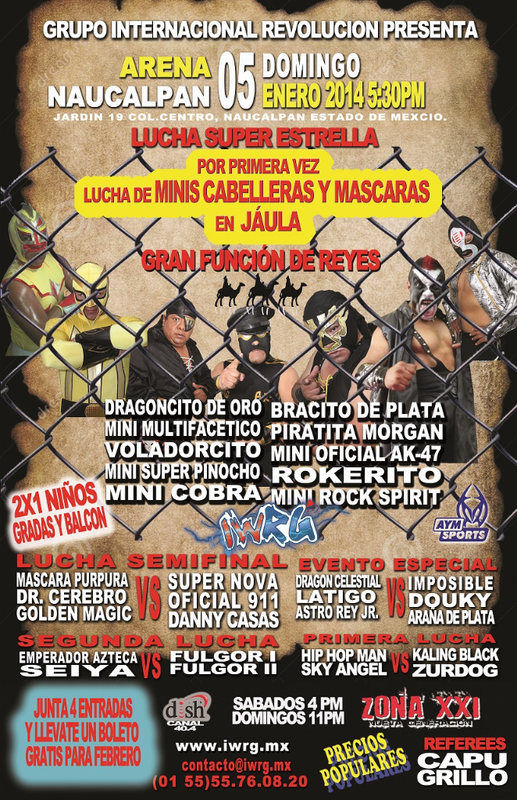 Hijo de Dos' debut here. Tecnicos took 2/3. 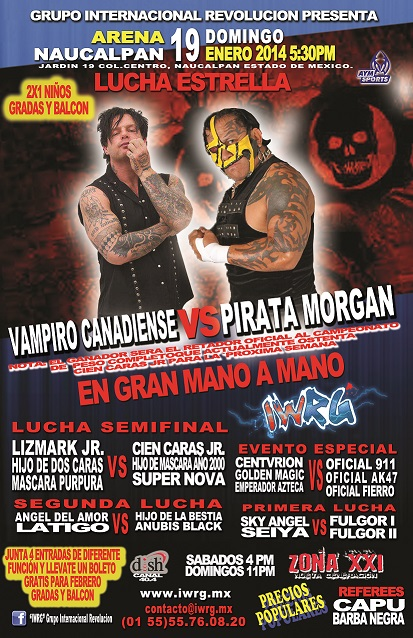 Vampiro beat Cien Caras Jr. with a backcracker to get revenge for last week. This led to Pirata/Cien challenges somehow. 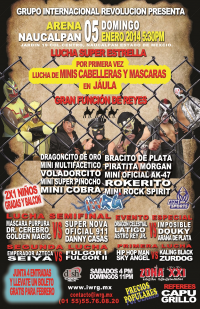 Hijo de La Bestia's debut. 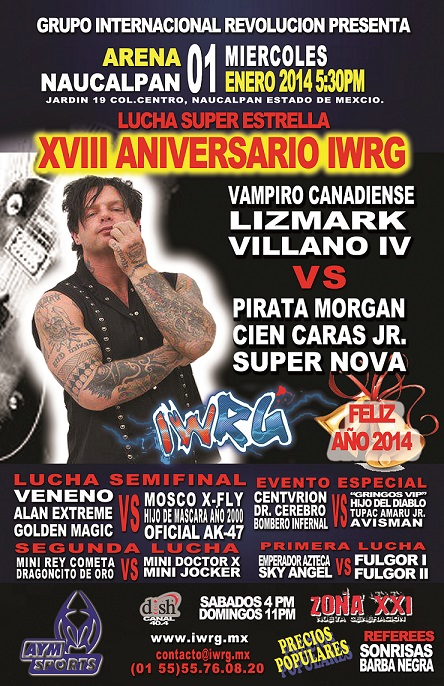 Hip Hop Man replaced Angel del Amor. Rudos destroyed Golden Magic, ripping up his mask again, but Magic pinned 911. 911 insisted it was only a two count. 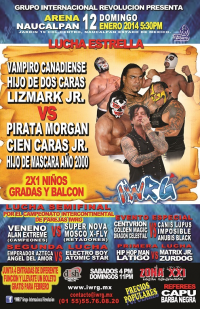 Hijo de Pirata Morgan replaced Cien Caras Jr. Mascara 2000 faked a foul in the first. Purpura did the same in the second - only Mascara just pinned him and it worked for three. 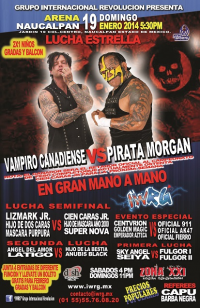 Vampiro hit the ref by mistake, Hijo de Pirata ran in to help his dad, Pirata went for the pin, and Vampiro surprised him and got the pin anyway. 1) Alfa & Omega b Kaling Black & Matrix Jr.
Hip Hop Man & Sky Angel have sort of matching outfits. Alan replaced Dragon Celestial. Alan german suplxed Anubis for the win. Latigo wants a shot at Fulgor's title. Rudos took 1/3. Purpura was hurt in the third fall. Refs checked on him, and Trauma I snuck a foul on Hijo de Dos. Vampiro won the title with a superplex. Cien Caras Jr. falls on his sixth defense. 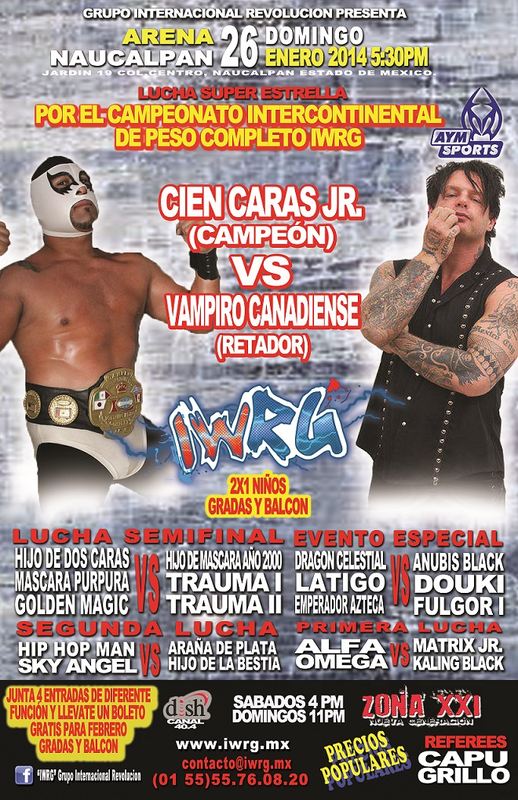 Vampiro is 19th champion.